that I am not sponsored by this brand, nor did I receive any compensation or reward for this review. 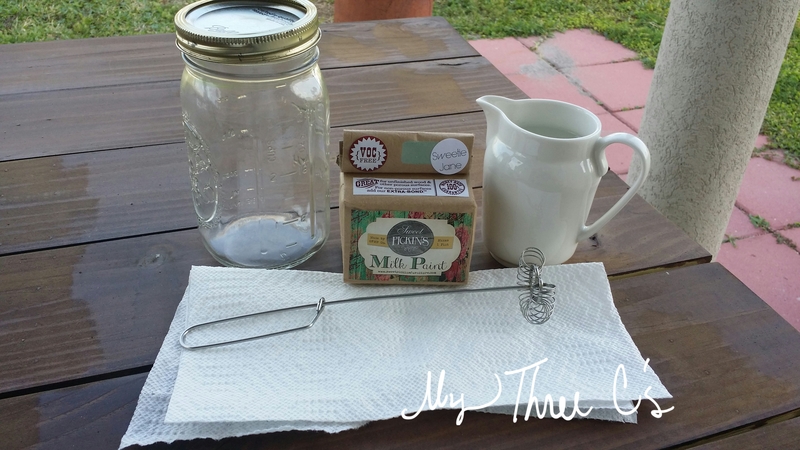 I am not sponsored by SPMP but I loved it so much, I am now a retailer!!!! I personally bought and paid for this paint and the words here are my own professional/personal opinion. So with that said, let me introduce you to my delicate little vanity. I picked up this lovely lady about a year ago and just knew she was a keeper. 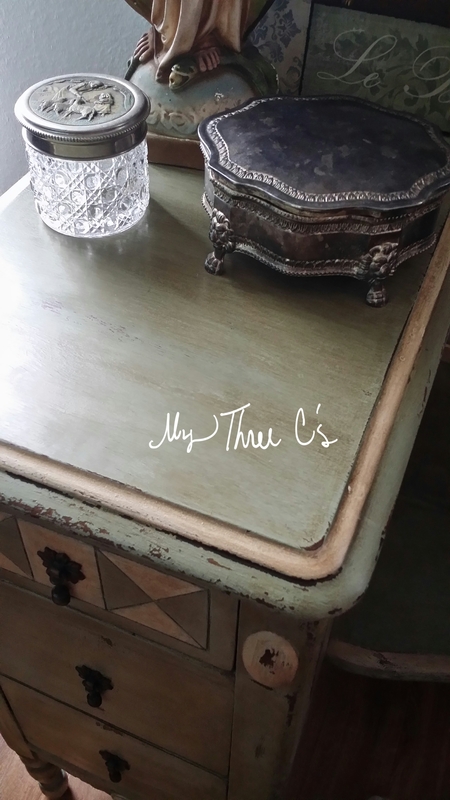 Truth is, I have been saving special items that I adore, for my future forever home. Someday when I am settled in the home of my dreams and I know I will never move again, I will display/use/repurpose these items that I have collected. 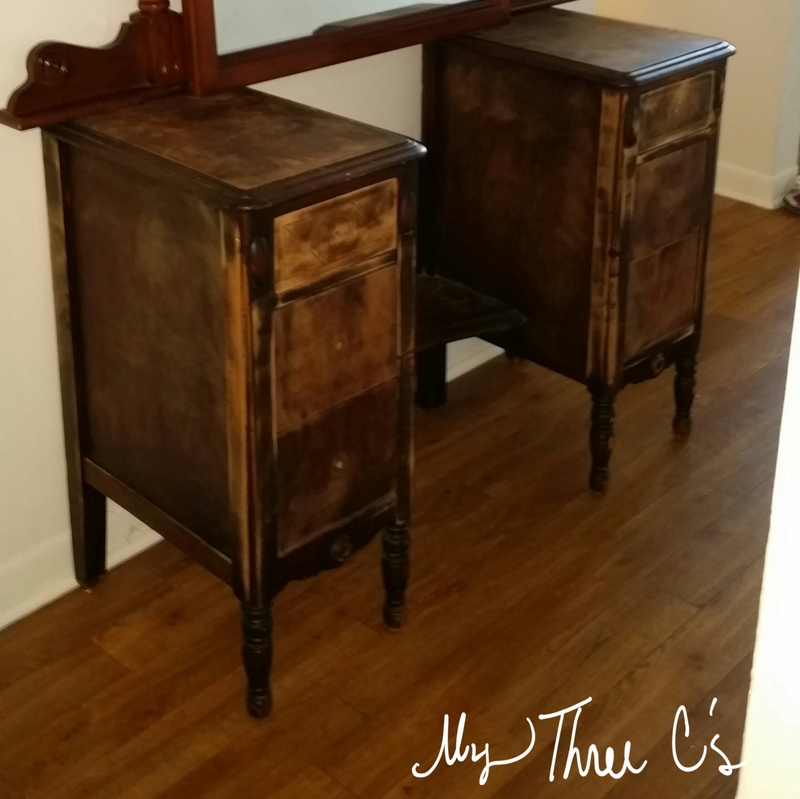 This vanity will someday be a bathroom component for a guest room or half bath. My vision is to have a free floating sink installed behind it. Anyway, it has been sitting around collecting dust because I just couldn’t commit to a paint color. That is until I was on Facebook and came across the Sweet Pickins Milk Paint line. 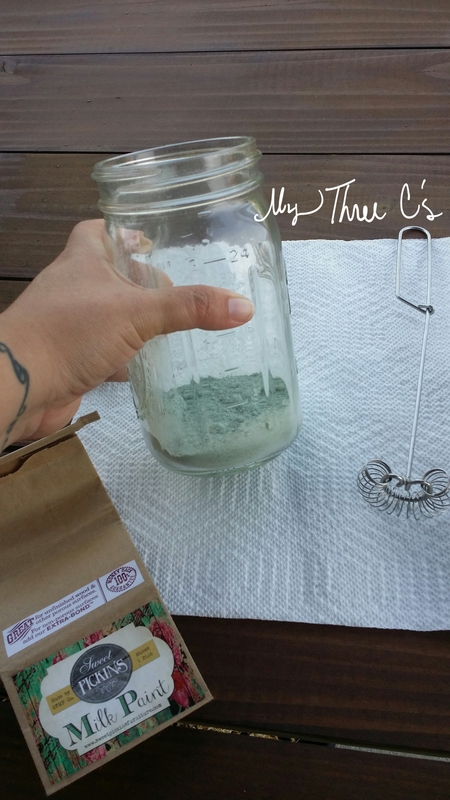 As soon as I saw the color Sweetie Jane, I was in love with its calming, greenish blue hue. It reminds me of ocean water on a choppy day. Plus, how can you read the name “Sweetie Jane” and not start doing a bad rendition of Cowboy Junkies? I really liked the way there were examples of actual furniture pieces on the Sweet Pickins Facebook site and not just swatches. It gave me a better idea of what result I would get by using this particular color and gave me some inspiration as to what I could create. The ordering process was easy and fast. I received my paint in only a few days of my order. The packaging is very eye catching, feminine and springy. Full instructions were provided and were easy to follow. I opened up my paint to find it packaged in a plastic light proof bag. I kinda wish it was resealable, but that is no biggie. SPMP now comes in a reseal bag! Problem solved!!! I just folded down my bag and placed it in a sandwich bag when I was done with the mixing process. 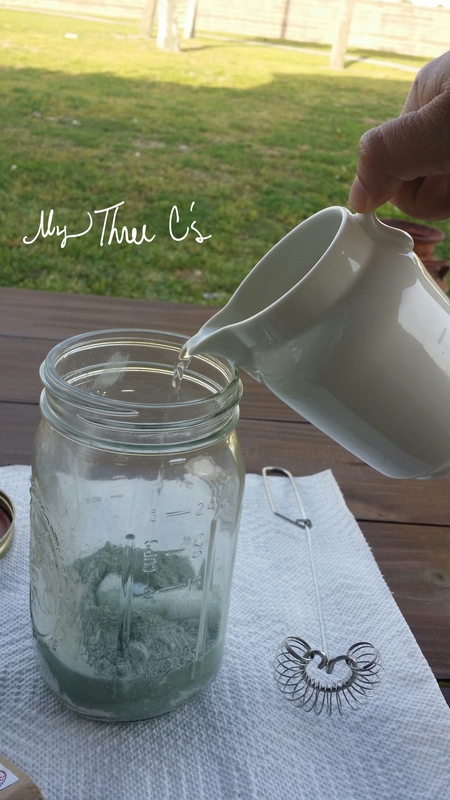 The mixing was very easy and consist of mixing equal parts of the milk paint powder with equal parts hot water. 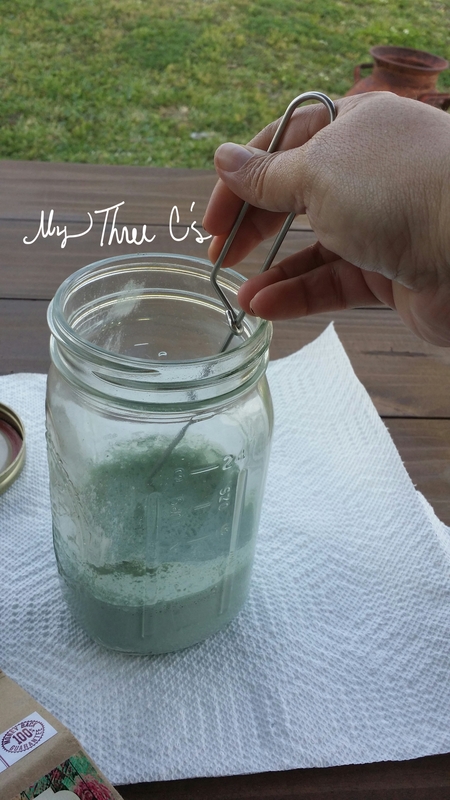 I used a mason jar and a tiny whisk to mix it up, but you can use a stir stick or brush to mix it together. The paint does have a slightly milky odor when mixing, and painting but it is not too strong or overwhelming. 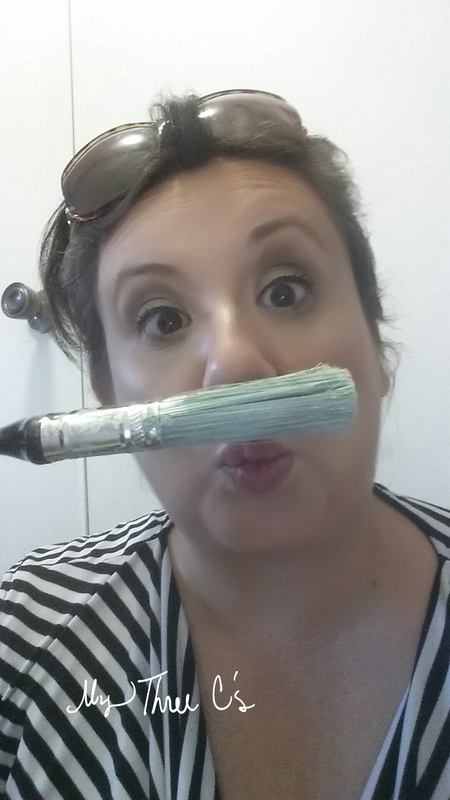 I painted indoors and I was not offended by the odor. 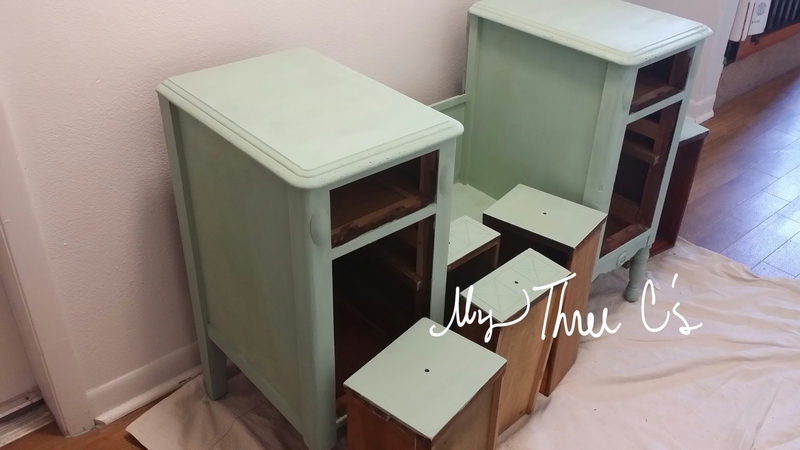 The milk paint went on very smoothly and didn’t run as badly as most milk paints do. That is not to say it was creamy or tacky. It just means that the recipe for the paint to water ratio left a good consistency of paint on the brush and gave a smooth application. I had to apply two coats of paint to my vanity to get the coverage I wanted. You could stick with one coat which would probably leave you with a weathered paint look, but that is not the way I wanted to go with this particular piece. 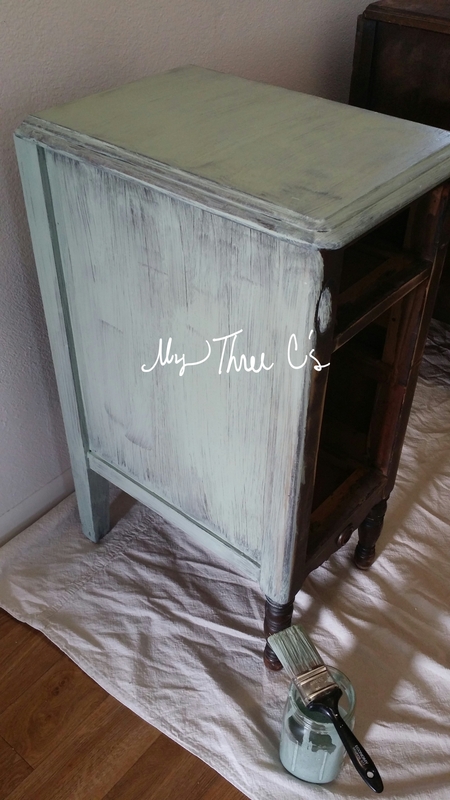 Once I had both coats on, I added some accents with a white milk paint I had on hand. This turned into a good little side experiment. 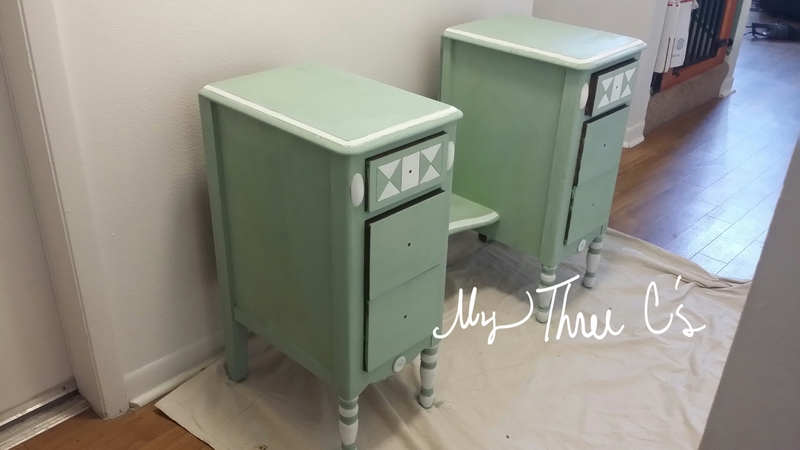 Turns out Sweet Pickins Milk Paint is compatible with other milk paints with no adverse reactions. That’s a good thing if you are running low on your favorite brand of milk paint and get in a pinch. 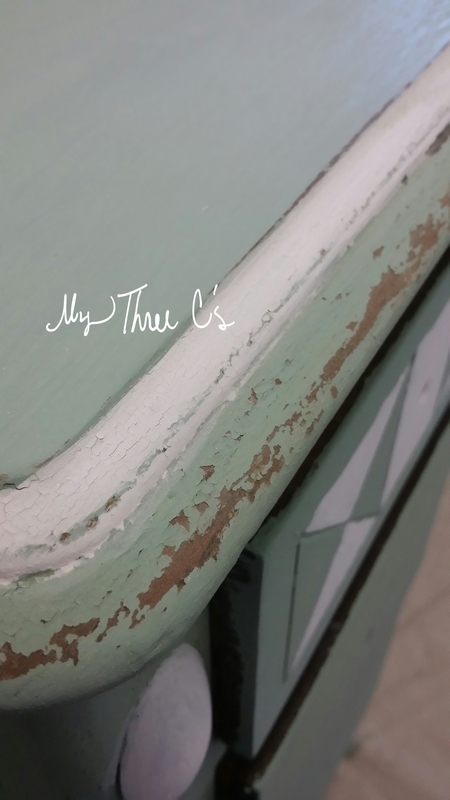 I allowed the paint to rest for a day (actually, I was super busy with kids and house work so I didn’t have a choice) and the results were exactly what I was hoping for! 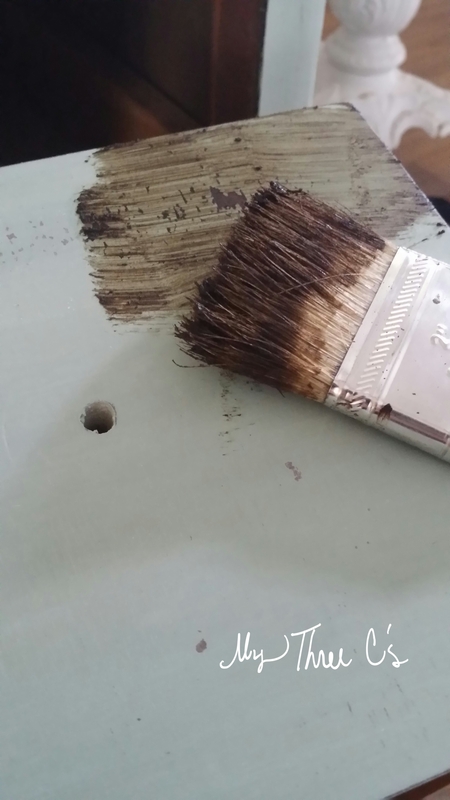 Random, chippy and multi tonal patches gave the illusion of old, original paint. I gave the piece an all over light sanding with 150 grit sandpaper then dusted it to remove any particulates that were on the vanity. The next step I did was to wax with a tinted wax. 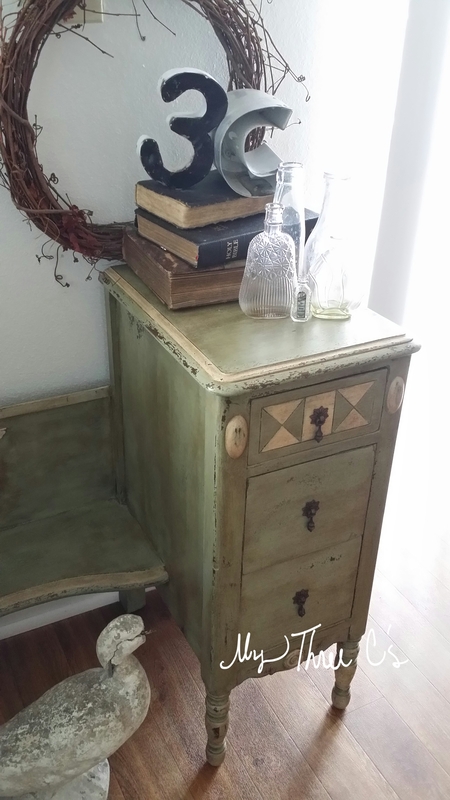 I used a dark wax I had on hand to give the piece an allover antiqued look and to give the design dimension and character. I applied the wax with a brush in small sections. I then let it set for no more than one minute then buffed it out. 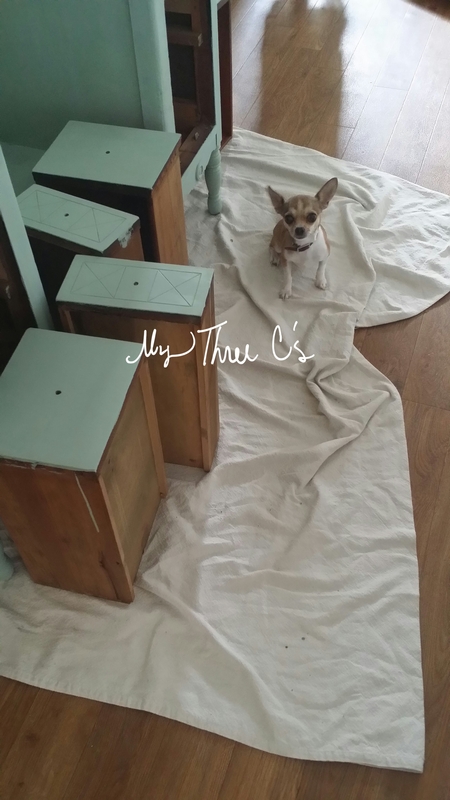 I continued with the whole piece of furniture until I was done. 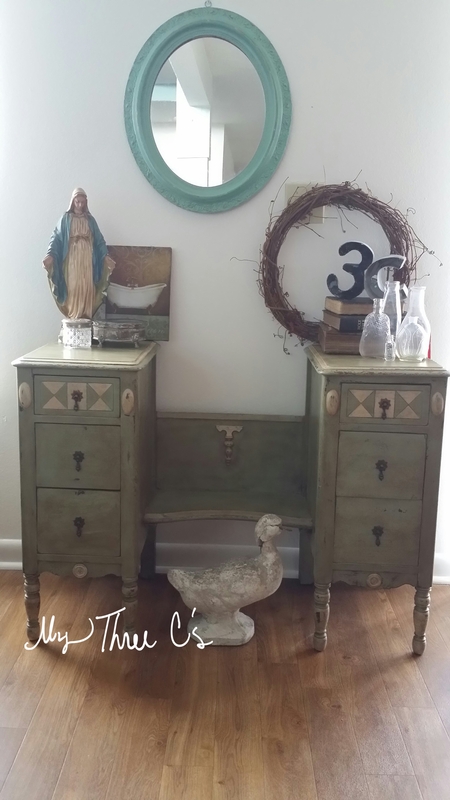 I reinstalled the old teardrop drawer pulls and staged it in a fitting place in my home. How does it look? 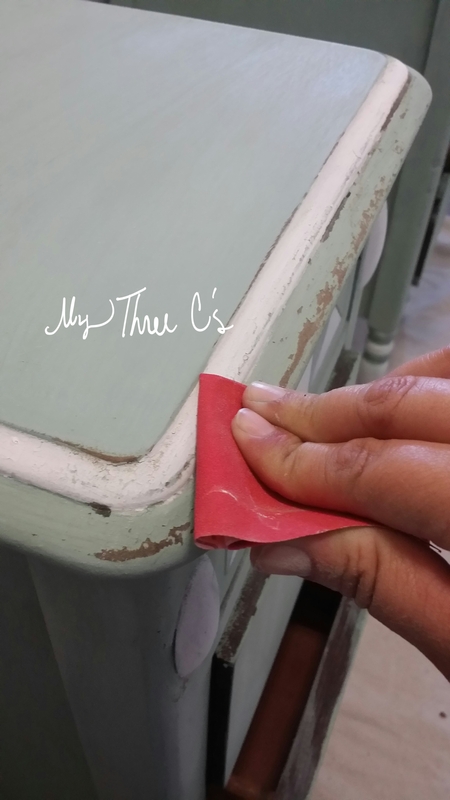 I am very impressed with Sweet Pickins Milk Paint! So much, that I would list it in my top 3 furniture painting supplies. 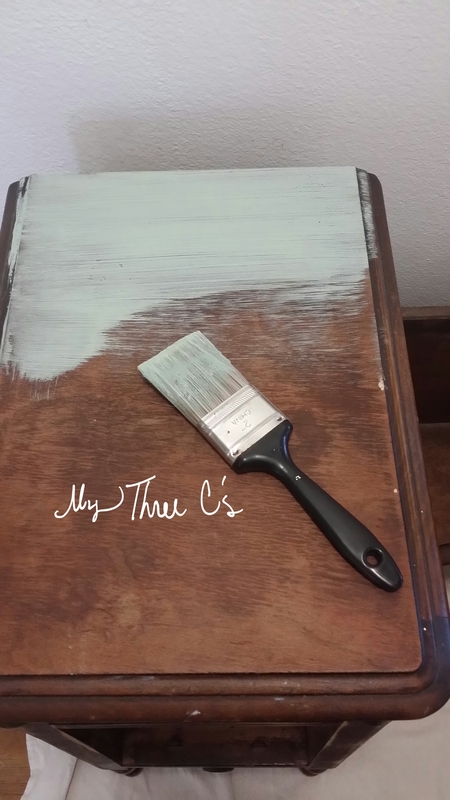 I was a little on the fence about milk paint until I tried this paint line. 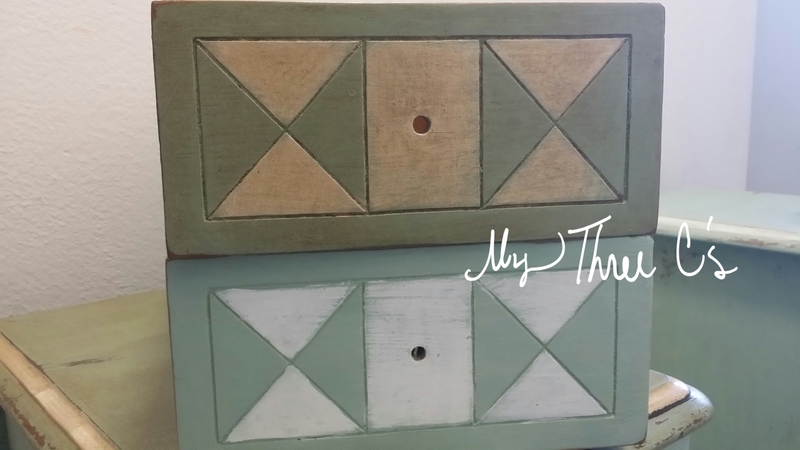 I did like the results that milk paint give you but I could never find colors that complemented my own personal palette. 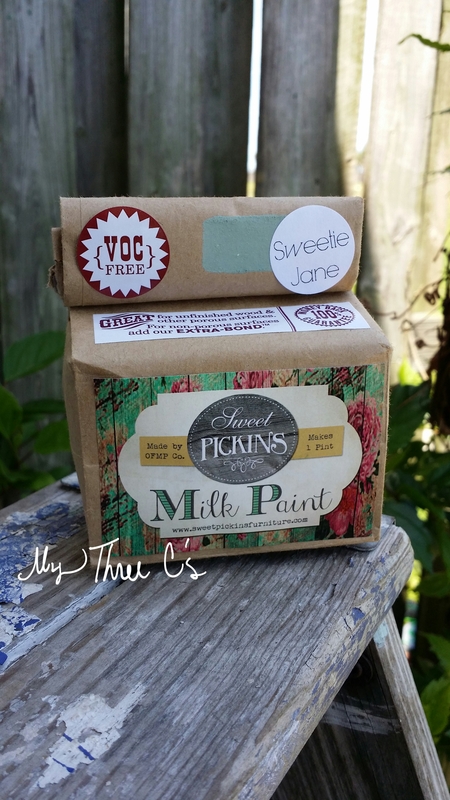 The color choices that Sweet Pickins provides are similar to colors I have used in the past or colors I know I would want to try. 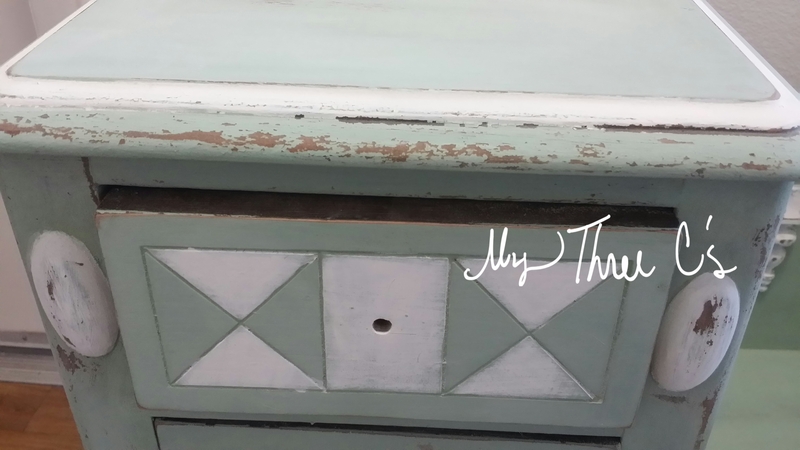 The quality of the milk paint powder is exceptional and the cost is well worth it. 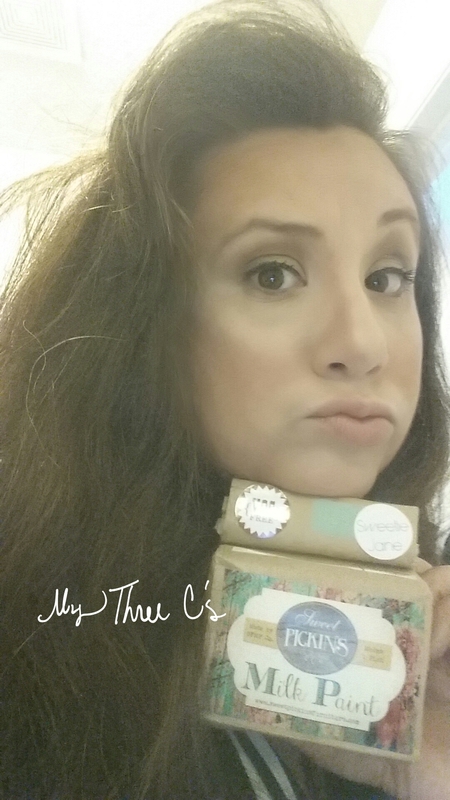 I plan on placing another order very soon. You can find Sweet Pickins Milk Paint at www.sweetpickinsfurniture.com or on facebook at www.facebook.com/SweetPickinsFurniture. 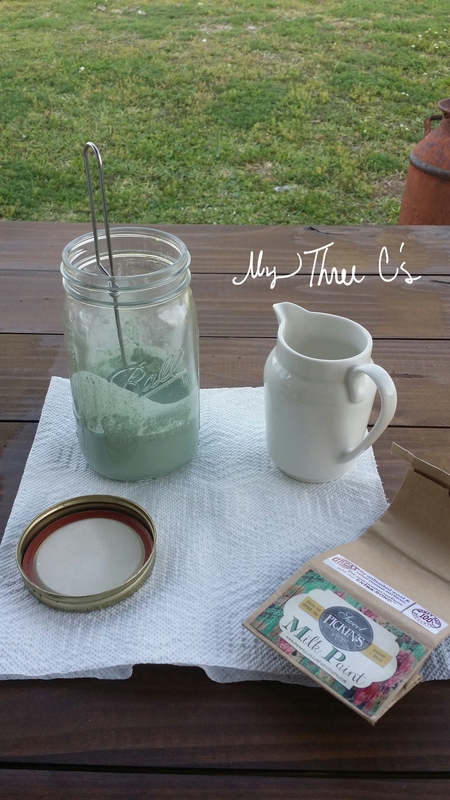 Make sure to tell them you heard about Sweet Pickins Milk Paint here on My Three C’s blog.